Aftermath saw Temmin “Snap” Wexley, his droid companion Bones, and his pilot mother Norra Wexley make their names in what was the first story in the Aftermath Trilogy. Life Debt sees Norra and her group of rebels set on a mission to locate rebel hero Han Solo, who is on his way to Kashyyyk to help liberate the planet from under the ruling of the Empire. Han’s first attempt didn’t go as planned, resulting with Chewbacca being captured and the Imperial council finding itself under the leadership of Gallius Rax, a mastermind with links to the planet of Jakku. One of Rax’s first actions is to appoint Grand Admiral Rae Sloane as the face of the Empire. There is a deep underlying theme within the Imperial side of the story surrounding Rax and Sloane. Sloane finds herself feeling like an errand girl delivering Rax’s orders to the Empire, even when she doesn’t agree with them. What Rae Sloane wants for the Empire and what Rax wants are two completely different things which lead to Sloane taking matters into her own hands. The book is essentially broken down into three main stories, the search for Han Solo, the liberation of Kashyyyk, and the birth of the First Order courtesy of Gallius Rax. Despite being a great start to the trilogy, the plot for Life Debt is leaps and bounds above Aftermath’s packed full with humour, heartbreak, violence, romance and mystery; things that readers expect from a Star Wars story. With regards to the original characters from Aftermath, Chuck Wendig doesn’t waste any time giving readers a clear picture of where Norra Wexley and her group of ragtag Rebels are after the conclusion of Aftermath. The group find themselves on a crusade hunting down Imperial war criminals and bringing them to justice for their crimes before being tasked with the search of Han Solo. The introduction of characters from the Original Trilogy added another robust layer to the story with Han and Leia anchoring the story for the heroes whilst Rax and Sloane do the same for the Empire. In parts Leia seems vulnerable; her husband is missing, the New Republic is immovable and she is connecting to her unborn child with the force. She also sees her personality clashing with Mon Mothma because of her idealist approach to the world and believes in doing good for every inhabitant of the galaxy, whereas Mothma has a realist approach to her methods. “We argue, about whether it is the time to build up military or to dampen its effect. And all the while we forget that we have the privilege of arguing from comfortable chairs many parsecs away. We argue about what’s prudent or what’s practical while people suffer. Do you know what people want to see from the New Republic? Do you, truly? They want us to be heroes. – Princess Leia’s argument against Mon Mothma. Han solo’s relationship with Chewbacca is captured beautifully in Life Debt. In one of the interludes from Aftermath, the pair is preparing to travel to Kashyyyk with intentions of liberating Chewie’s home planet from under the clasp of the Empire, leading to the Wookiee being captured. Han’s loyalty to Chewbacca is evident as he decides to leave his wife and unborn child as well as resigning his commission with the New Republic in order to locate his friend. 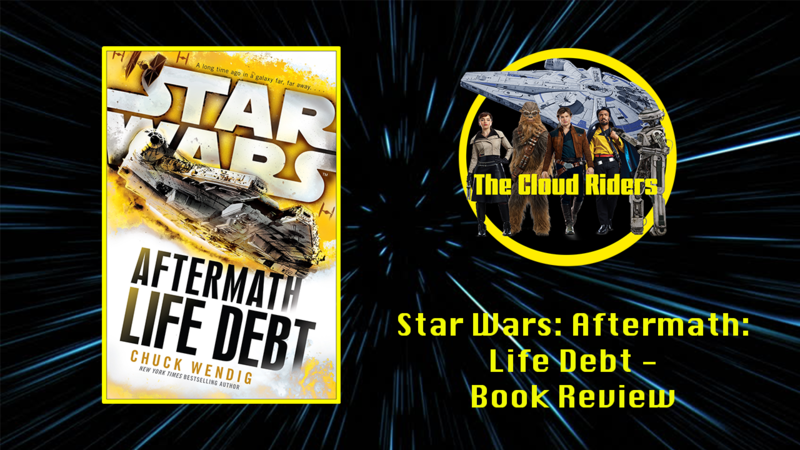 Similarly to Aftermath, Life Debt features interludes that give a wider perception of the galaxy. It seems as if the Empire has been dragged down immensely after its defeat during the Battle of Endor, offshoots of the empire are resorting to suicidal tactics against the New Republic, an Imperial Super Star Destroyer finds itself being hijacked by pirates and the entire fleet abandons its post on Ryloth. Maz Kanata features in an interlude where she is enforcing laws in her Takodano castle, and law and order has returned to Tatooine after the demise of crime lord Jabba the Hutt and his criminal organisation. Wendig’s second entry to the Aftermath Trilogy promised higher intensity leading up to the events of The Force Awakens and it certainly delivered with an engaging plot, a strong, developing chemistry between Aftermath’s original characters as well as the additions from the original trilogy. There are also a lot of details provided to help fill the gaps between Return of the Jedi and The Force Awakens.